Home Theater is populated by an abundance of connection options for sending audio and video signals to your TV or video projector, and hearing sound from your home theater audio system and speakers or soundbar. One type of connection used for audio is referred to as Digital Optical. Digital Optical is a physical connection that that uses light (fiber optics) to transfer audio data digitally (1's and O's) from a compatible source device to a compatible playback device using a specially designed cable and connector. The audio data is converted from digitally encoded electrical pulses to light pulses on the transmission end using an LED light bulb (not a Laser as many think). After the light passes through the digital optical cable to its destination, the light pulses are then converted back to electrical pulses containing the audio information. The electrical sound pulses then travel further through the compatible destination device (such as a home theater or stereo receiver) that processes them and eventually converts them to analog signals and amplifies them so that they can be heard through speakers or headphones. In home audio and home theater, digital optical connections are used by a number of devices for transferring specific types of digital audio signals. Devices that may provide the digital optical connection option include DVD players, Blu-ray Disc players, media streamers, cable/satellite boxes, home theater receivers, most soundbars, and, in some cases CD players and newer stereo receivers. The types of digital audio signals that can be transferred by a digital optical connection include two-channel stereo PCM, Dolby Digital/Dolby Digital EX, DTS Digital Surround, and DTS ES. Digital audio signals, such as 5.1/7.1 multi-channel PCM, Dolby Digital Plus, Dolby TrueHD, Dolby Atmos, DTS-HD Master Audio, DTS:X, and Auro 3D Audio cannot be transferred via Digital Optical connections. To transfer these types of audio signal formats you need to use HDMI connections. When the digital optical connection was developed, it was made to accommodate the digital audio standards at the time (mainly 2-channel CD playback). In addition, it also provided enough bandwidth space for basic Dolby Digital and DTS Digital Surround but did not include the bandwidth capacity for the more advanced 5.1/7.1 channel PCM, Dolby Digital Plus, Dolby TrueHD, Dolby Atmos, DTS-HD Master Audio, or DTS:X surround sound formats. Also, although all Home Theater Receivers, DVD players, most Media Streamers, Cable/Satellite Boxes, and even some Stereo Receivers have a digital optical connection option, there are some Blu-ray Disc players that have eliminated digital optical as one of the audio connection options, opting for an HDMI-only output for both audio and video. On the other hand, Ultra HD Blu-ray players, usually include a digital optical audio output option, but it is up to the manufacturer – digital optical connectivity is not a required feature on either Blu-ray or Ultra HD Blu-ray players. If you have a home theater receiver that has digital optical connections but does not provide HDMI connections, make sure when you shop for a newer Blu-ray Disc player, Ultra HD Blu-ray Disc player, media streamer or other source devices, that it has a digital optical audio connection. Although digital optical connections may be included in DVD/Blu-ray/Ultra HD disc players or media streamers, they are not designed to transfer video signals. This means that when connecting a DVD/Blu-ray/Ultra HD player or media streamer to a home theater receiver and you want to use the digital optical connection option, that is for audio only. For video, you need to use a separate, different, type of connection, such as HDMI, component, or composite. 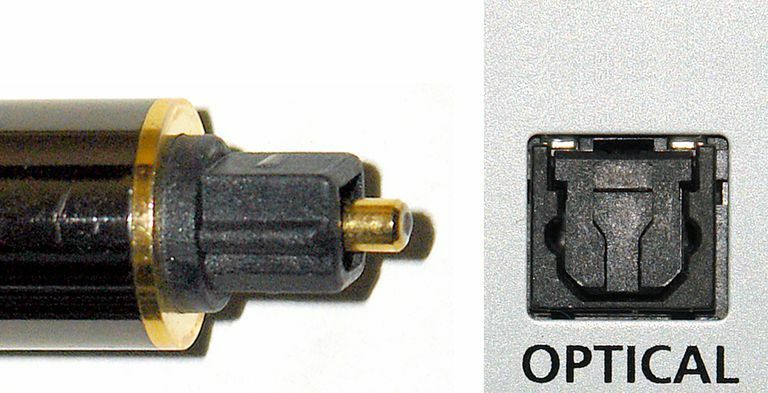 Digital Optical connections are also referred to as Toslink connections. Toslink is short for "Toshiba Link" as Toshiba was the company that invented and introduced it into the consumer market. The development and implementation of the digital optical (Toslink) connection paralleled the introduction of the CD audio format, where it was first used in high-end CD players before it expanded into its current role in home theater audio. Digital Optical is one of several connection options that can be used to transfer audio signals from a compatible source device to a TV, home theater receiver (and, in some cases, a stereo receiver or soundbar). However, it is limited as to which audio formats can be transferred. To dig deeper into the history, construction, and technical specifications of Digital Optical/Toslink connections refer to TOSLINK Interconnect History & Basics (via Audioholics). There is also another digital audio connection option that has the same specifications, including the same audio format transfer limitations, as Digital Optical, and that is Digital Coaxial. However, instead of using light to transfer audio signals, they are transferred via traditional wire using RCA-style connectors.